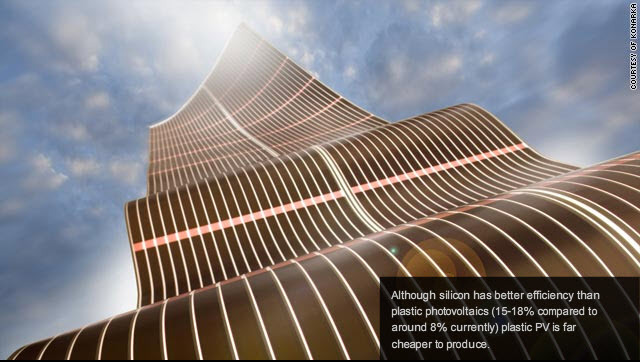 London (CNN) -- Cheaper and lighter compared to its more expensive, cumbersome silicon cousin, plastic photovoltaics (PV) could herald a revolution in the solar power market, according to a UK solar panel expert. "Plastics are much cheaper to process than silicon. In principle the devices we've been making might be very, very cheap and cover large areas," said David Lidzey from the UK's University of Sheffield. Unlike rigid silicon panels, plastic (or organic) PV is far more flexible making it easier to install, which Lidzey says could hand it a huge advantage. Polymer solar panels differ from most commercial plastics like polythene which are essentially insulators. Turning them from a material that prevents conductivity into ones that promote it requires chemists to "tweak their molecular structure," says Lidzey. But he says some everyday plastic products aren't a million miles away from the plastic PV he's researching. "If you look at a (chip) packet, what you've got is a plastic film, a few layers of inks and a printed metal layer to keep the materials fresh. Rearrange the order of those layers and you get to a structure that's very similar to the PV devices we're looking at," Lidzey said. On of the leading lights in developing plastic PV is U.S.-based tech company, Konarka who are already applying their "Power Plastic" technology to a wide range of products including luggage and parasols. 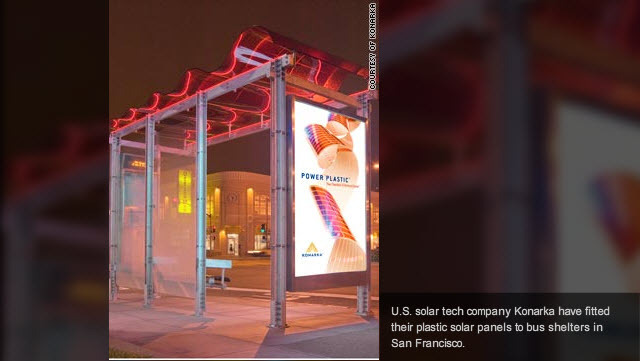 Larger arrays are also being fitted to street furniture, as can be seen with San Francisco's bus shelters. Researchers are also hopeful that buildings could also get the plastic treatment in the future. In 2009, Konarka installed a "curtain wall" to an outside section of its Florida offices as part of a pilot project. 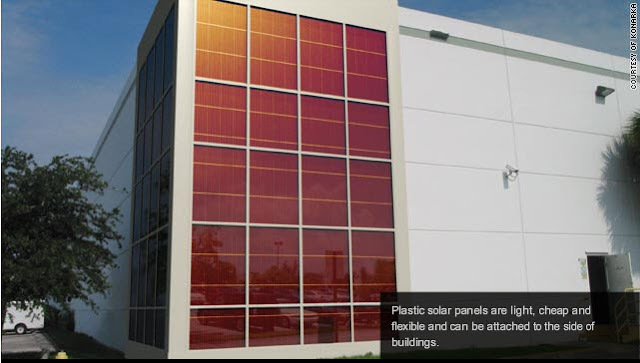 Plastic PV, say the company, can absorb sunlight from "all sorts of ranges" allowing it to be installed onto vertical walls. Founded in 2001, Konarka are one of many companies trying to perfect the technology. And the news is increasingly promising. But there are some issues to be resolved before plastic can truly find its place in the sun. Whereas silicon has an efficiency of around 15-18%, plastic devices can only achieve 7-8% at best, currently. Problems also remain with operational lifetime. Silicon devices will generally last around 20 years and are very stable, Lidzey says. Organic-based (plastic) systems are less so, degrading much more quickly. But things are improving. "There is a lot of activity to find out what the mechanisms are by which these materials degrade so we can produce better packaging materials to prevent this," Lidzey said. He concedes there is some way to go before plastic PV catches up with silicon's superior efficiency and durability, but even that might not be an issue, he says. "The idea is that you might not need to catch up provided you can make them cheap enough," he said. "My guess is that it will be between five and ten years, and then we will see a significant volume of devices being made from plastic."